Vision Y: Is true Progress possible? Some German Kids think the Answer is: Yes! Two weeks ago, I had the great honor of attending the first Munich Leadership Conference, organized by the Munich Leadership Institute – and hosting brilliant speakers such as Prof. Barry Schwartz, Prof. Barbara Kellerman, and Prof. Franz-Josef Radermacher. The overarching motto of the conference was: “How to achieve true progress”. 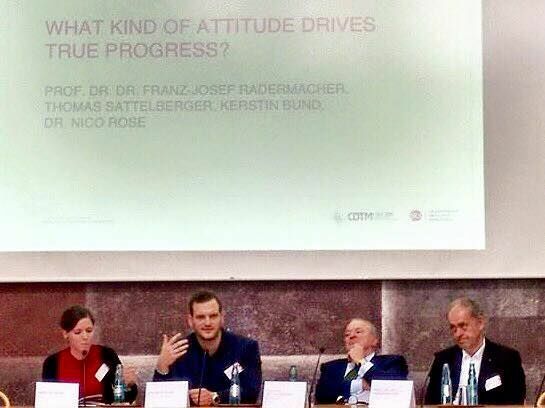 I had an active part in the conference, being part of a panel discussion on the question of “What attitudes drive true progress? The other panelists were Thomas Sattelberger, former CHRO of Deutsche Telekom, Kerstin Bund, a journalist who works for the Zeit, Germany´s most popular weekly newspaper, and the aforementioned Prof. Radermacher. The highlight of the conference was the first public presentation of the so-called “Vision Y” – a framework for a peaceful, more egalitarian, and sustainable future – which a group of students envisioned after having interviewed thought leaders such as Nobel Laureate Muhammad Yunus, scientist/author Nassim Taleb, and German Vice-Chancellor Sigmar Gabriel. A lot of the things that were presented reminded me of what Martin Seligman told us in the last MAPP class of 2013 about his personal vision for the year 2051. If you are interested in the “Vision Y” (and you should be…), please watch the following short clip that provides an audio-visual summary. Additionally, Wikipedia founder Jimmy Wales was awarded with the “Deutscher Vordenker Preis 2015” (German Thought Leader Award).